Want to create your own Fountain of Youth? Who doesn’t right? 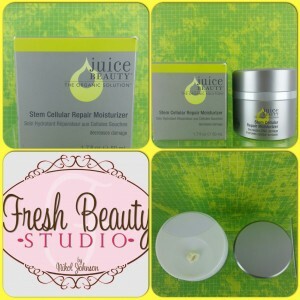 I received Juice Beauty Stem Cellular Repair Moisturizer in my monthly beauty Must Have Box from PopSugar. Besides the ultra cool product packaging and delicious lemon scent which makes you feel like you are sipping on a lemoncello perhaps on the island of Capri? Let me give you my first impressions on what I think of this product. First to find a moisturizer that has No (get ready for this list it’s a long one) Parabens, Propylene or Butylene Glycols, Petroleum, Sulphates, PEG’s, TEA, DEA, Phthalates, GMO, Silicones, Pesticides, Artificial Dyes or Fragrance is not only HUGE but what you savvy beauty heath conscious girls need to be on the look out for. This product packs a powerful skin care punch in aggressively firming the skin and decreasing wrinkles. What are fruit stem cells? What do they do for my skin? In this product Juice Beauty has a proprietary blend of fruit stem cells including apple, grape buds and lemon bark. This moisturizer also has infused Vitamin C and organic resveratrol grapeseed rich formula to repair damage and aggressively firm and decrease wrinkles. Best of all it’s certified organic, antioxidant-rich with plant oils to hydrate and improve elasticity for age defying results. Packaging is also very important, you can see from my pictures that it’s completely hygienic, scooping out product with your hands breeds bacteria and allows germs to grow. A unique product where you push down on the top to reveal the delish product coming out in just the right amount; no over dispensing here and wasting product. I have been testing out this product at night, I like the feel of a heavier moisturizer to attack my fine lines and wrinkles while I get my beauty sleep. I love the smell, feel and lack of harmful additives and chemicals. There are vegan products to choose from and actress Alicia Silverstone has her own collection for Juice Beauty. Would love to hear your comments on any of the Juice Beauty products you have tried and loved, hated or are dying to try.